If you live and fish in East Tennessee, there is a good chance that you've fished the Clinch River at some point. The river was one of the better tailwaters in the area for many years before declining. Lately it seems to be on the comeback trail probably largely due to new special regulations such as the ones that have made the Caney Fork such a spectacular fishery. Just when things were looking up, news of a potential environmental disaster is coming from the very banks of the river. The Kingston Coal Plant is a Tennessee Valley Authority (TVA) coal-fired powerplant that apparently just polluted a rather large area. One environmental attorney called that statement "irresponsible." The ash that gives sludge its thick, pudding-like consistency in this case is known as fly ash, which results from the combustion of coal. Fly ash contains concentrated amounts of mercury, arsenic and benzine, said Chandra Taylor, staff attorney for the Southern Environmental Law Center. 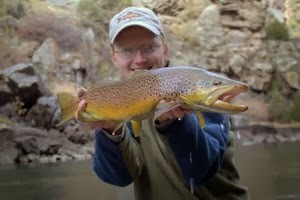 This fall has been a great one for catching large brown trout. The Caney was phenomenal albeit a bit crowded at times. The Clinch produced good fish and the Cumberland was spectacular as should be expected. Unfortunately the hopeful end of the drought has also coincided with increased generation be TVA on the tailwaters throughout the region. 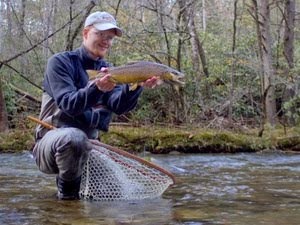 One of the only tailwaters with a reliable schedule for fishing lately has been the South Holston River. During the past week, I've fished the SoHo twice and found good fish both times. Local anglers have been catching fish up to 15 and even 20 pounds and while I never saw any of the real behemoths, I did find plenty of willing fish and even a few good fish. My best fish was a female of around 20 inches that took an egg pattern as soon as I got a good drift. I landed another very large male that was not fair hooked so this fish does not really count but was still a beautiful fish that I enjoyed getting to see up close. I had spotted a really good fish but couldn't see it very well. Casting just above where I thought the fish was, my line went tight almost before the flies hit the water. I reacted by setting the hook into what turned out to be the wrong end of the fish. After following the fish downriver, I got it under control and managed to remove mine and some other flies as well that the poor fish had picked up somewhere. This was the last fish of the day and while I enjoyed fishing for large tailwater trout, I'm really missing the simplicity of a small stream, a 4 weight and a handful of dry flies. Our most recent poll closed a couple of days ago and the results surprised me a bit. I honestly did not expect to discover that nearly a third of you use fluorocarbon tippet for all your fishing. Well over half are using it for at least some of your fishing while just over one quarter of you don't use it at all. It took me a long time to start using it and lately I've been using it more and more. Two summers ago I started using it when a buddy recommended I get some for the Frying Pan River in Colorado. My first spool was Seaguar Grand Max in 6X andit is still the best I've ever used although quite expensive. The beauty of using Fluorocarbon is that it supposedly is harder to see underwater compared to standard monofilament. Even better, it is stronger than comparable mono. Lately I've switched over to the Rio Fluoroflex Plus which is almost as good as the Seaguar. It is also a little cheaper which is good for the money starved trout bum. Cheaper here is relative and a good spool of fluorocarbon tippet will generally set you back $10 more than a comparable spool of mono tippet. So now the big question, is it really worth it? After catching lots of large trout over the last two years, I'm really becoming a believer in the stuff. I've lost an unbelievable number of good fish due to the 6X monofilament breaking but have yet to break off a good fish on fluorocarbon tippet. 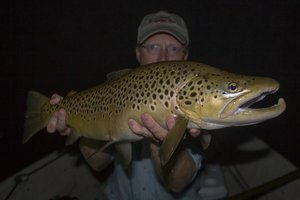 A few weeks ago, I fought a monster brown on the Caney for several minutes before losing it. The line just went limp and I was sure it had broke off. Reeling in I discovered that the large fish had just straightened the #14 hook. A fish large enough to straighten a #14 hook is a big fish but it did not break the 6X tippet. On the initial run the fish headed straight for a large log and I was forced to apply a lot of pressure. With monofilament I have no doubt that I would have broke the fish off. So again, I ask, is it worth it? After two major storms systems this past week, the southeastern United States may be well on the way to recovering from the ongoing drought. Here in Tennessee, three day rainfall totals were upwards of 4 inches across a wide area with some places getting even more. Area streams and rivers are flowing high and strong again for the first time in awhile. Center Hill Lake has come up 6 feet in the last 4 days meaning the Caney Fork will be unfishable for wade fisherman for quite awhile. Little River in Townsend peaked at over 3000 cfs and is still flowing well above normal. The forecast for the next week calls for more rain so things are definitely improving. That's fine with me as the well-known tailwater has been getting hammered for the last several weeks and this should give the fish a chance to grow without the constant fishing pressure. This time of year often brings on a shad kill meaning those that want to brave the high flows and rip streamers might catch a large fish. Right now it might be a little two high. I'd probably wait until they cut back to one generator but then it should start to get interesting. The fish will be even stronger due to the high flows. The weather situation out west is encouraging as well. 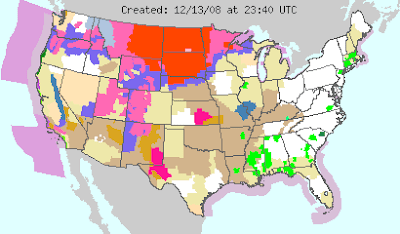 A quick check of the National Weather Service homepage shows winter storm warnings, blizzard warnings, and winter weather advisories across much of the west . Forecasts for the entire Rocky Mountain region from Arizona and New Mexico north to Montana for the next week indicate several strong storm systems will traverse the region over the next several days. Lots of snow means a good fishing year next summer so the more the better! Midges are extremely important as a trout food on many waters around the country. My buddy Trevor Smart told me about this amazing video from Ralph and Lisa Cutter which shows the various stages of the midge life cycle. The Caney Fork has become one of the top tailwaters in Tennessee but unfortunately everyone seems to know about it. The crowds are only getting worse so if you decide to fish it consider yourself fairly warned. Despite the crowds the river still fishes well, that is if you don't mind constantly being crowded. Last Friday I headed down to the river to fish and was the first one on a particular run. I started out with a new pattern that I have thanks to James Marsh from over at The Perfect Fly Store and Fly Fishing the Smoky Mountains. The fly was a Cream Midge Pupa and the Caney trout were taking the pattern well. There were lots of midges hatching when I first arrived at the river and the occasional rise looked more like the fish were taking bugs just under the surface. In this situation a midge pupa is deadly (another favorite is the Zebra Midge) and the fish responded well to the new pattern. I had probably 20 minutes of fishing in when some more people showed up and proceeded to box me in on the extreme upper end of wadeable water at that access point. Things slowed down but I knew it was a good spot. Deciding to hang in there, I spent the next hour or more changing flies and tinkering with my rig. Finally I got things dialed in again and started catching fish again. The guys below me decided it was the best spot on the river after I caught several fish and as soon as I left, they headed right up. None of the fish I caught were monsters this trip but there were several decent fish to around 17 inches including to gorgeous rainbows that fought like tigers. I honestly thought I had tied into a big brown both times I hooked a good rainbow but was pleasantly surprised to find one of the Caney's better 'bows attached. The browns should be off the spawning shoals soon if they aren't already and the best fishing is yet to come. Those cold days when most people are smart enough to stay home will provide some of the best fishing of the year. This time of year provides a lot to be thankful for. From a fishing perspective things couldn't be better. The cooler temperatures are keeping the crowds off the streams but the fish are still feeding heavily making a fishing trip a lot of fun. Yesterday I had the opportunity to fish the South Holston. Opportunities for large fish were minimal unfortunately but I still had an incredible day fishing with friends. The weather was great and it was fun to be on the water again. Tomorrow I'll be wetting a line somewhere else, probably on the Caney. I'm definitely thankful for good health and the privilege of fishing as much as I do. In other things, I'm thankful to almost be done with college. Graduation will be here in another three weeks or so. I have a great family and lots of good friends. God has definitely blessed me and life is good! I hope everyone that reads this blog has a great Thanksgiving and thanks for stopping by! Coming soon...some of the best fishing of the year...and according to our poll most of you will be taking advantage of the prime fishing conditions. As winter conditions become the norm, more and more people are staying home instead of getting out and fishing, at least that's what I thought. Our most recent poll would lead one to believe otherwise. Nearly 80% of respondents said that they get out and fish during some of the best fishing conditions of the year, otherwise known as winter. Based on personal experience, I have a hard time believing that this is an accurate sample of all fly fisherman. The last two weekends of fishing on the Caney Fork seem to have reinforced this belief. While catching plenty of nice fish, my buddies and I often had large sections of the river to ourselves without putting in much effort. This is highly unusual on the popular middle Tennessee tailwater where it sometimes feels like you should have brought your own rock. Many people stay away once the air temperature drop but as many of you obviously know, this is a huge mistake. I won't complain though because it leaves lots of water for me. Once again I spent some time on the river this past weekend. Unfortunately it looks like that will be my last time on the water until next week during break. The cold weather kept a lot of people off the river for a second weekend in a row. This was good for us because it meant we were able to fish all the best runs without any competition for a change. Our first stop didn't produce any fish over 16 inches or so. Despite the lack of larger fish, the fishing was still excellent. There were several times that we were all hooked up simultaneously. The river is absolutely on fire right now if you have the correct flies and know where the fish like to feed. The water started coming up after we had fished for a couple of hours so we headed up to fish just below the dam. This proved to be a good choice and we found the largest fish we spotted all day. After working a pod of good fish for several minutes, I finally hooked one and it immediately went ballistic. Thankfully all my knots held and I was soon admiring a beautiful male brown in the shallows. After a couple photographs, I released the fish and watched it bolt back to the dark run it calls home. Later on I came back to the same pod after they had calmed down and hooked a beast. The fish tore across the river towards a log on the far bank but I somehow managed to keep it from hanging up. Next it decided to head downriver. Moving quickly in pursuit, I grew increasingly nervous as the battle was becoming drawn out and I knew it was a monster. Suddenly the line went limp and I was left to ponder what might have been. Reeling in my line I discovered that it was no fault of my own. The #16 hook had straightened out partially, just enough for the big fish to gain its freedom. My buddy Joe Mcgroom also managed to catch a pig. If he wasn't ruined last week he definitely is now. Yesterday I drove up to fish the Smokies and look for big browns. While the fishing was not bad, I didn't catch any of the monsters that I was hoping for. In fact we didn't even see fish over 18" although we probably just didn't look in the right spots. 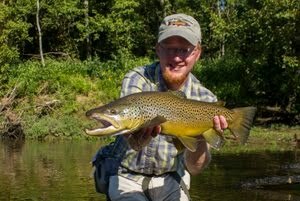 There is at least one large brown somewhere in the park because Smokies guide Ian Rutter caught it last week. Most people would love to catch a fish that nice (myself included) but catching the large fish in the park doesn't happen overnight. It takes a lot of time on the water learning the stream and the fish before it happens...until I catch one of my own, I'll be looking at the pictures of Rutter's brown a few more times... I'm sure there are at least a few more to be caught, so while the tailwaters are fun I'll definitely be heading for the park again sometime soon. Tiny flies, light tippet, sight fishing...this is about as much fun as you can have while fly fishing for trout in my opinion. Large flies with heavy tippet may produce explosive strikes but then it is just a tug of war. With light tippet and small flies you have to be gentle so as not to break off the fish, bend the hook or pop the hook free. The tailwaters have been providing some excellent opportunities for large fish lately and I've been on three separate tailwaters in the last three weeks or so. This past Sunday I fished with my buddy Joe Mcgroom of Little River Outfitters and my cousin Nathan Stanaway. Joe wanted to check out the Caney Fork River. My cousin just likes to catch fish so I've been teaching him the way of the long rod after he was forced to admit that it was superior to his beloved spinning rod. Impressively he has taken to it like a natural. This past Sunday he caught plenty of nice fish including the Caney slam of a rainbow, brown and brook trout. The best action lately has been on midges but other patterns are working as well including red copper johns. Sight fishing opportunities are good early in the day before the water comes up and again very late in the day once the water falls out. Each fall I try to make at least one camping trip somewhere in the mountains. Here in Tennessee that means I almost always head for the Smokies. The year I was in Arizona gave me the opportunity to visit the White Mountains where you can fish with a backdrop of golden aspen while listening to the elk bugling in the distance. No matter where I am though, the theme of visiting mountains stays the same. This year I made the trip to the Smokies for my annual trip. The plan was to camp out Smokemont Campground which I had never stayed at before. Now that I've been there, I have to admit that I like Elkmont better but that might just be because the Little River watershed is really my home waters. The North Carolina side of the park has plenty of great water to fish including one of my park favorites, Deep Creek. Other than Little River, Deep Creek would have to be my favorite for several reasons including the excellent population of brown trout and also it receives less pressure than Little River once you get into the backcountry. While camping at Smokemont, I enjoyed fishing Deep Creek, a small blueline that will remain nameless, and Straight Fork. 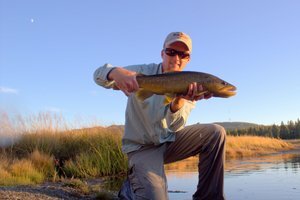 The fishing at Deep Creek was a bit more crowded than usual which was surprising but I still managed to catch a nice little brown to go along with some small rainbows. While over there we also took in some of the area scenery including the Indian Creek falls. On Saturday, we decided to do some hiking to enjoy the great fall colors. We also wanted a hike with a view so that meant a trip up to the top of the ridge where we decided to hike to Andrews Bald. I have been wanting to hike to one of the balds for some time now. This was the first time that I've visited one and the scenery was fantastic. Straight Fork was a blast to fish. I've always enjoyed fishing it and am always surprised at how well it fishes despite the easy roadside access for several miles. By this time the rest of our group had left to head back to Chattanooga so I enjoyed a couple of hours of solo fishing. The fish rose steadily to my October Caddis pattern which I tied on after seeing some giant caddis flying around. I even managed a couple rainbows that were larger than the normal park average by a couple of inches.